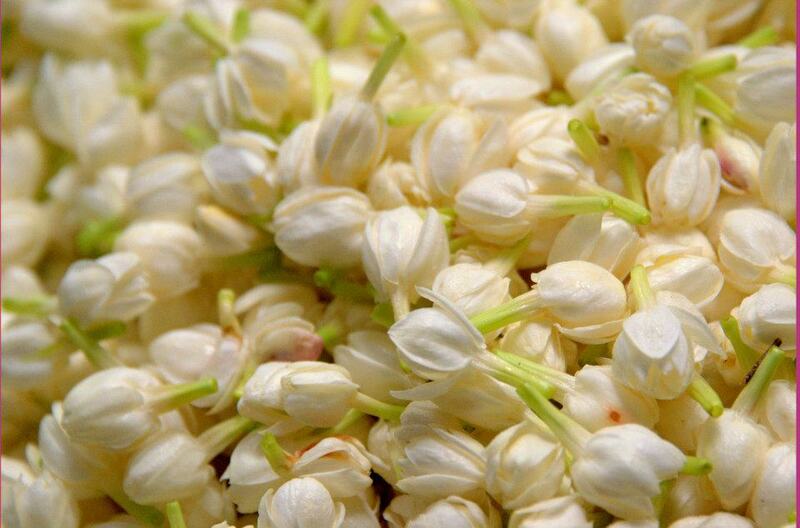 Madurai Malli is jasmine flower which is known for its powerful, mysteriously attractive and seductive fragrance. It is known as Madurai Malli because of its place of origin namely Madurai. Madurai is in the province of Tamil Nadu in India. All the women of Tamil Nadu at least once in their life time would have adorned their hair with this highly scented beautiful flower. The distinctive smell or the fragrance of the Madurai Malli when combined with the aroma of the hair oil and the hair is alluring. The Madurai Malli is a very old traditional flower and has a botanical name of Jasminium. This flower is mainly cultivated in the district of Madurai and other neighboring places like Virudhunagar, Theni, Dindugal, and Sivaganga. MADURAI MALLI – PHYSICAL TRAIT -The Madurai Malli can be explained with a physical trait of bud which is round to oblong, with short to medium corolla tubes and three to four whorls of petals. Thus this deep scented flower noted with thick petals, long petioles have buds which open at night and during the day time the buds withhold their scent and when the sunlight fades away, they release their perfume to float on the air. The stunning fragrance of the Madurai Malli in the air gives a romantic appeal both to the place and to the people who have decked them with the flower. The Jasmine city or Madurai is also known as Malligai Managar. Some areas within the district of Madurai which are known for the growing of Madurai Malli are Perungudi, Nilakottai, Uthappanaickanur, and Ammainaickanur. HARVEST IS DONE EVERY TEN DAYS – The farmers of these areas bloom along with the flower and work in full swing during the season which lasts from February to November. One harvest is processed every ten days, which includes the entire process of irrigating, fertilizing, and picking the buds. Though there are different varieties of the jasmine flower which are grown in different parts of Tamil Nadu but still Madurai Malli takes the pride of getting a special identity. Madurai city on the banks of the Vaigai River is a very old historical city in India, ruled by the great Pandaya Kings and is nearly 2,500 years old. Apart from malli it is known across the globe for its magnificent Madurai Meenakshi Amman temple. More than for its beauty and fragrance the jasmine flowers or flowers in general are of great cultural importance to the people of South India. FLOWER VENDORS ARE VERY BUSY IN THE MARKET PLACE -Flower vendors are very busy in the market place selling the jasmine flower for various purposes like for marriages, religious ceremony, functions, and festivals in Madurai. We can never miss the site of the jasmine flowers being sold at the entrance of the temples, at public sites, and in business areas in India. The flowers are offered for sale chiefly during the evenings, since that is the time when the buds begin releasing their fragrance. It is also grown in homes either in gardens or in pots. Apart from being adorned by girls and the women folk, the jasmine flowers are also used to decorate idols. In North India at the time of Chandhan Yatra festival of Lord Jagannath, the deity is bathed with jasmine flower water. Madurai Malli adds to the pride of the city right from Sangam age and lot of mentions about this malli can be seen in literary works like Paripaadal, Madurai Kanchi, Silappathikaram and Kurinji Paattu. IDEAL SEASON FOR THE GROWTH OF MADURAI MALLI – The ideal season for the growth of Madurai malli is warm summer and bright sunny days. The soil requirement for malli also varies for it can be cultivated from sandy loam to even clay soils. But sill the most preferred soil would be a well- drained rich sandy loam soil. The weeds are to be removed by ploughing the soil which may be done either once or twice depending upon the soil conditions. Once weeding and ploughing is done pits are dug at a size of 30 cu. m. and each pit should be filled with at least 10 kg of Farm Yard Manure and only then it should be covered. Rooted cuttings are purchased for planting and it is usually done during the months of June-November. A spacing of 1.5 m x 1.5 m. is required between each plant. Now the land is ready for irrigation. Based on the weather conditions and the nature of the soil, irrigation has to be done. However the first irrigation is done immediately after planting and subsequent irrigation at an interval of 7-10 days. MANURING IS A MUST FOR THE PLANTS – Manuring is a must for the plants and it is split into two where one is done after the annual pruning and the second one during the months of June-July. Each plant is manured with 10kg of farm yard manure, 60 gms of Nitrogen and 120 gms each of Phosphorus and Potassium. Weeding and strengthening of irrigation channel and bunds are the intercultural operations followed for jasmine cultivation. After 20-25 days of planting the first weeding should be done. Followed by the first weeding once in every 2-3 months weeding should be done. Otherwise it will affect the cultivation of the crop. Pruning is a technique which enhances the crop where the shoots of the past season including the dead and the affected branches are removed. Irrigation is generally avoided prior to pruning. Pruning helps in increased yield and quality of the flower when done during the last week of November.Care should be taken from pest attack of the plant. Only after six months of planting flowering takes place in the month of March-April. Picking should be done early in the morning before sunrise. The planter should anticipate for a period of at least six months for commercial yield. MADURAI MALLI HAS DIFFERENT VARIETIES – During the first year, 750 kg of flowers could be obtained, and it increases to 2000 kg in second year, 2500 kg in third year and 3500 kg per acre from fourth year onwards.The Madurai Malli by itself has different varieties and among which the most popular variety is Gundu Malli which is botanically known as Jasminium sambac. The Gundu Mallis are featured with thick petals where it is greenish white in colour when plucked from the plant but turns into milky white in a few hours and remains in that lovely white for a maximum of 24 hours without change in color. The specialty of the Madurai Malli is its fragrance which is absent in jasmine from other parts of the state and the main reason behind it is because of the soil which has got aromatic alkaloids jamone and alpha terpineol.The lateritic and red soils of Madurai district are rich in sulphur, which is the precursor of these alkaloids. The other different varieties of Malli include Jasminum grandiflora, Jasminum multiforum and Polianthes tuberosa. JASMINUM GRANDIFLORA IS CULTIVATED FOR ORNAMENTAL PURPOSES -Jasminum grandiflora is cultivated for ornamental purposes and its leaves are mainly used in Ayurveda medicine. They are mainly cultivated in warm temperate and sub tropical areas. Jasminum multiforum is known by different names like winter jasmine, Indian jasmine, downy jasmine, and star jasmine and very popularly known in Sanskrit as Magha Mallika because it flowers in the winter month of Magha in the Indian Hindu Calendar. Very close to the Madurai Malli is the Polianthes tuberosa which is mainly used in making perfumes. The jasmine flowers are noted for their high yield and it can continuously produce flowers for nearly 15 successive years. During the first year of production, jasmine farmers harvest up to 750 kg of jasmine flowers by per acre. The yield rises each year; in the second year, the plant may yield 2,000 kg of jasmine buds per acre, in the third year the yield is around 2,500 kg per acre, and in the third year, the yield is around 3,500 kg per acre. But however when there is frequent rainfall the yield is very fast and more with the result of oversupply to the market and thereby fall in the selling price. -The Maduari Malli also takes the pride of being the first flower in Tamil Nadu for being granted with Geographical Indications (GI) Mark which was granted in the year 2013.The effort to get a GI tag was put forth by a private organization, in collaboration with the University of Agriculture in Madurai and the Madurai Malli Farmers Association, requested that the Registrar of Trade Marks and GI in Chennai provide Madurai Malli with the Geographical Indications tag. Apart from the demand for Madurai Malli in the local market it is also exported to other parts of the country like London, France, Malaysia, and Dubai where they are air -lifted by a special packing of Styrofoam and gel ice mats to retain freshness during the transport. The Madurai flower market is always crowded because there is a continuous demand for this flower throughout the year. Apart from being used for ornamental purposes, the Madurai malli is also sourced for the manufacture of jasmine scented perfumes.Madurai has got its first GI tag for its product of Sungudi sarees and then for the Madurai Malli. In the category for flowers the first GI certification was given for Mysore Malli and then it is the Madurai Malli. -The registration gives a legal protection for the growers who need not go for further for individual registration and only those involved in the cultivation are only entitled to use the word “Madurai Malli’’. 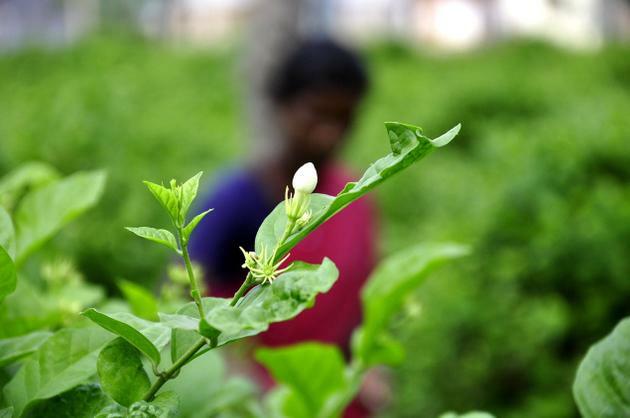 Madurai Malli is woven in six different forms, ‘uruttu kattu,’ ‘pattai katti,’ ‘kadhambam,’ ‘maalai’ and ‘thirumbipaar.’ The farmers involved in the growing of the jasmine witness both the peak and the fall in the price and are highly affected during the later in spite of the GI tag. The peak season for the Madurai Malli is between the Tamil months of Chithirai and Aadi. Sometimes when the yield is low which is during the months of Aippasi to Thai the prices even shoot up to Rs.1000 – Rs.2000 per kilogram. When the yield is very high the price drops down to even Rs.10 per kilo gram thereby affecting the farmers to a great extent. -However the GI tag has helped the farmers to prevent adulteration when exported. The retailers buy the malli from the growers and then it reaches the consumers through different shops and street vendors. Apart from the local every day market , the malli takes its journey to other countries through the international markets. It’s a fast race at break-neck speed. It goes like that the flowers are sent from Madurai to Chennai by flight before eight in the morning and then they are packed in specially made thermacol boxes and air-lifted to main top four destinations namely London, France, Kuala Lumpur and Dubai. The perfume makers make the best deal when there is a fall in the price of the flowers.